If you have friends who live around the world you should use e-card very often, because every special time you have to send e-cards to your friends. 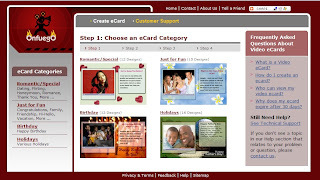 For me, I always forgot these special days, so I did not use e-card very often. Another way, e-card looks always same style to me. Sorry for my friends, most times I just deleted e-cards when I got them. I think if you change a little it should make a little bit difference, like send a video card to your friends. Onfuego is a website that helps you make and sand video card to your friends. It has several styles for different events, like birthday, wedding, holiday, romance or just for fun. To make your own video card is very easy, just pick a video mode from Card Categories, you can use your webcam to record your video, or upload a video from your computer (50MB). Fill your email, your friend's email, and your message, click "Submit" button it will start recording or upload file. After all done, it will send an email with video card link to your friends. Just click that link you can watch this video card on Onfuego, it will keep 30 days on server.